Medvedik took a little break from his daily routine and travelled to France. He made a mistake of choosing the low-cost airline, which was not so low-cost, by the way. He had to arrive to the airport pretty early, and the airport to take the flight was located 50 kms from the city, so he was sleepy and grumpy. The service girl told him that his bag was 2 cm’s wider than by standards of their cabin luggage and he had to drop it, paying 50 EUR for a piece of luggage. It made him quite angry but he decided to be cool. He went through the customs without much problems, but in the waiting zone there was no place for him to seat. He thought that some standing would only do him good since he was going to fly for a couple of hours in a sitting position… then he looked at the line waiting to get to the plane (1.5 hours before boarding) and he thought… well, if I get any seat in this strange plane. He had to fight with other people to get in the plane, but he eventually found a seat and fastened his seatbelt around his white belly. As he prepared to take off, he felt that he was getting a little hungry. He had a can of sardines in his bag, but as soon as he tried to get it out the flight attendant appeared out of nowhere and told him that he could only eat things sold on board. In case he failed to comply with the rules, he would be fined EUR 50. Oh my god, though Medvedik. This is a nightmare! He closed his eyes and tried to fall asleep. But the notifications and announcement were so loud and pronounced every 2 minutes… Never again, just never again. He looked at the ground disappearing in the clouds, wishing he could just jump out and stay on the comfy and soft cloud. 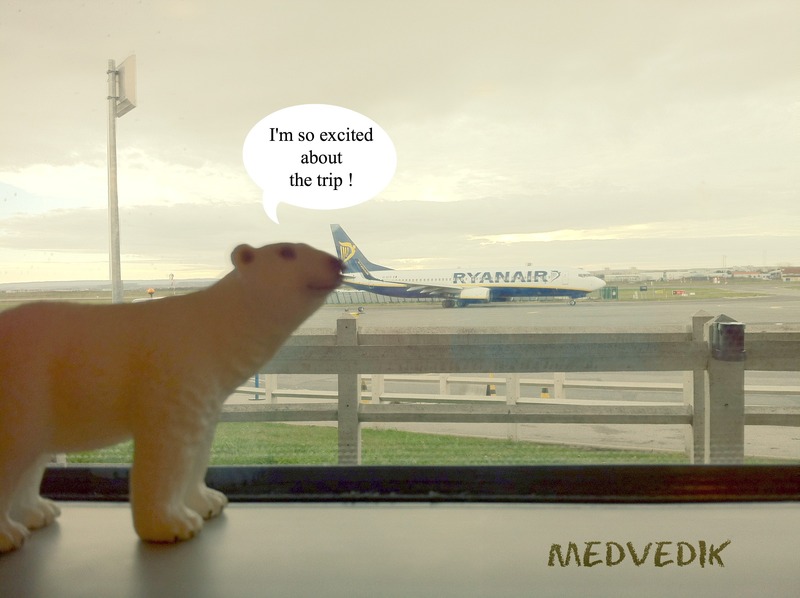 This entry was posted in France, Travelling and tagged bear, economy, funny story, low-cost, medvedik, plane, polar bear, ryanair, schleich, toy, travel, travelling. Bookmark the permalink.